Dottie Angel Challenge of the Utmost Kind – the end? 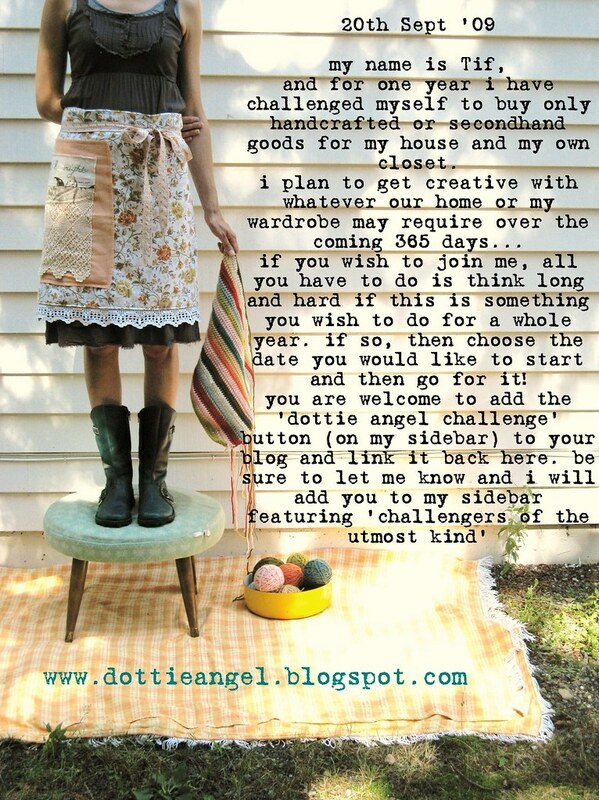 I have just realised that it has been a full year since I agreed to do the Dottie Angel Challenge of the Utmost Kind! This challenge was to buy only handmade or second-hand items for a full year – or to make the items myself. I took on the challenge for a few reasons: to see how I could come up with creative solutions to find or make the things I have needed, and to see what kind of impact a challenge like this would have on my household. The hardest thing about this challenge was wrapping my mind around the fact that I had committed to NOT BUYING NEW STUFF. It wasn’t that I have needed to buy anything, but as soon as I had decided to take the challenge on I had begun to regret it. It isn’t like I was spending money willy-nilly in the first place! Already I had been shopping for clothes in second-hand stores and hand-making presents. There really isn’t a lot that we do buy on a regular basis.I’ve always been very conscious about where our money is spent, because the large majority of what we earn goes back into the household in the form of food, rent, petrol and bills. It has always been fun to spend what there is left over on a little treat now and then. In the end, the challenge was made easy by not having much $$ to spare on buying stuff in the first place – even treats – regardless of how I felt about the restrictions I had placed upon myself. I did buy some things new: mostly clothes for the family that I didn’t have the opportunity to make myself. Shoes. Hats. Underwear. When our tax money came in I bought some books that I have wanted to own and a couple of kitchen appliances that I needed to support my family’s nutrition. I am quite happy to borrow from the library but when you borrow books three or four times in a row, it is probably a good time to think about owning them. Even still, I did my best to source second-hand copies of these books. I love second-hand books. I love knowing that someone else has handled them, read them, gained something from them and then passed them on. The year prior to taking the challenge I had sworn that I would not buy the children any more toys because I felt that they already had a wonderful and very special collection of playthings, many of them that David and I have made ourselves. In fact, as the year has gone past we’ve even culled that collection significantly. The children’s interests have changed and moved on, so the toys I have put away ‘for a rainy day’ have now actually been given away or donated to charity. What we have left are a core collection of useful playthings that still form the basis of the children’s imaginative play. Without any more toys, the children have become used to making things themselves, and the arrival of a new large cardboard box, a ball of string and a reel of sticky tape still brings an extraordinary amount of delight. We make use of a toy library when we need something new to inspire some different play. What I have gained, through the experience of this challenge is an awareness of how much we really DON’T need in our lives. The cost of living in Australia is biting us, and yet when I remember the fact that I actually have a place to live, food to eat, clothes to wear, a car to drive, and that we can afford to school our children at a place of our choice (that we even have a choice!) I feel incredibly lucky. Instead of needing or wanting to buy more, I feel the need to reduce our possessions, and the more I go through the things I own, the less I feel we need to have. We moved house recently, and before we even began packing I spent several weeks going through our home clearing clutter. More items left the house during packing, more again left our lives once we moved and began unpacking. Even now I am still filling up boxes with items we just do not need. So Dottie Angel was not wrong when she said it would be a challenge of the ‘utmost kind’. It transformed in an unexpected way into something very fulfilling. Well done! Sounds like you really rose to the challenge. I also have been in the process of decluttering. Feel like I am getting nowhere fast at times though. Its amazing how much stuff we accumulate that we never really use. I am even at the stage where I plan to give away a lot of my craft stuff! It seems to multiply faster than anything else due to donations and such. Our biggest shock though was when we climbed in the roof last week and pulled out the bags upon bags of teddy bears that the kids had been gifted over the years. I think they opted to keep one each. The rest will go to charity.